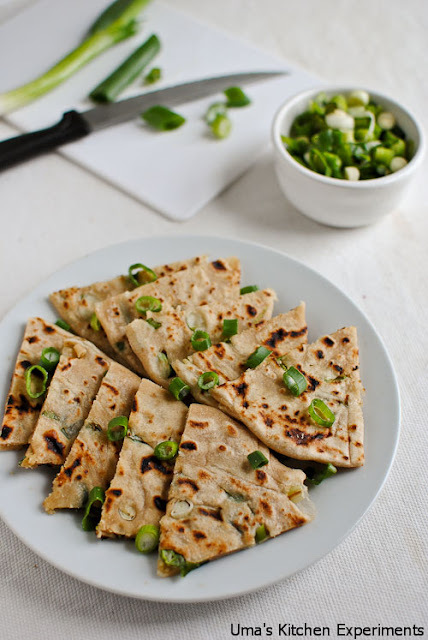 Whenever I visit Indian shops, I find these scallion pancakes in the frozen section. 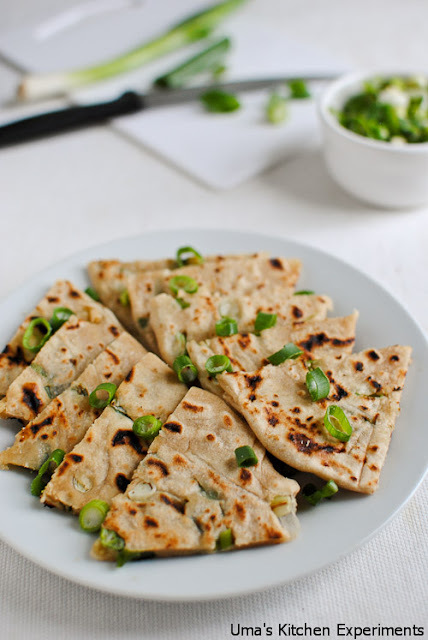 Once, I bought them along with flaky paratha(which I used for making vegetable kothu paratto) and found the procedure for making it is almost similar to flaky paratha. After knowing this, I prepared them at home using all purpose flour and wheat flour. The authentic recipe calls only all purpose flour. but, you can use only wheat flour for making it. The taste willbe more or less same. 1) In a mixing bowl, mix all purpose flour, wheat flour and salt. 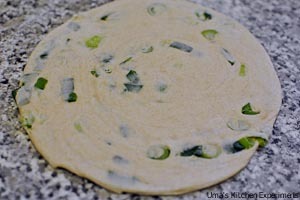 2) Add water little at a time and make a soft dough. Knead it for 10 minutes to make smooth dough. Cover and keep aside for 30 minutes. 3) After 30 minutes, divide the dough into equal size balls. 4) Take one ball in a floured kitchen surface and roll it to approx.20 CM wide. Make sure the dough is not sticking with the surface. 5) Apply a teaspoon or 2 in the rolled dough's surface using a brush. 6) Sprinkle a tablespoon of spring onion in the oiled surface. 7) Then, fold it in a zigzag manner(like a chinese fan) and as shown in the picture. You can also roll it like a cigar/rug. 8) At the end, make swirl/snail form as shown in the picture. Press down lightly using your fingers. 9) Gently roll it to 1/8th thickness with 10CM wide. 10) Heat the skillet. When it is hot, place the rolled pancake to it. 11) When one side is cooked, flip to cook other side. Make sure the flame is low to avoid burning outside. Use oil to cook if necessary. 12) When both the sides are cooked, cut into wedges and serve hot with any of your favourite sauce. Pancake looks yummy and perfect..
Nice goes well with Curd+Sugar garnished with chilli powder and Chat masala. 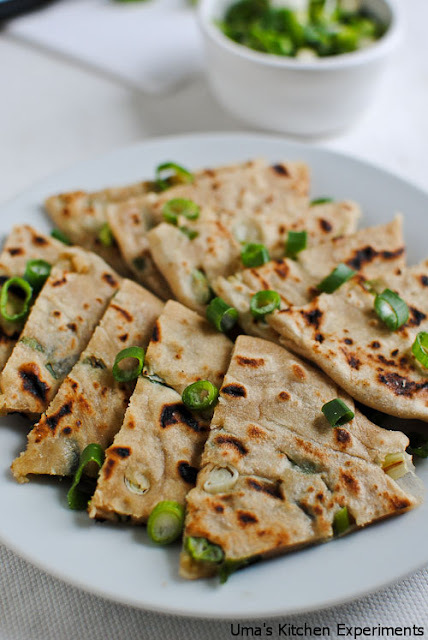 Love the addition of spring onion. Very yummy and colorful pancake. ver nice...i like the way u rolled the pancakes...nice picks too! very nicely done .. neat and clean work Uma..
wow, just fabulous dear..would have been very flavourful and aromatic ones.. Delicious pancakes..yummy yum,lovely clicks as well!! 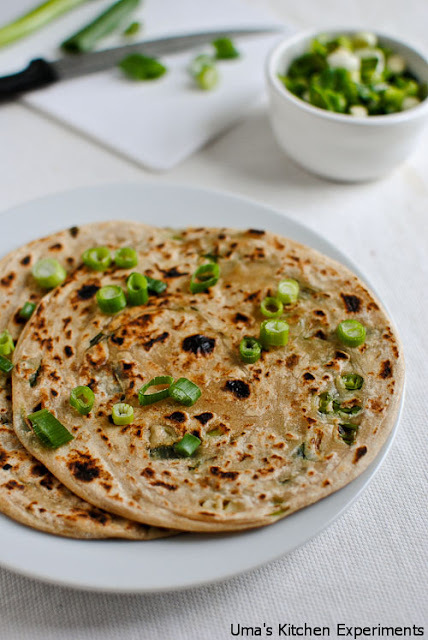 lovely parathas with spring onion...looks inviting, as always beautiful clicks Uma!! Lovely presentation and very helpful tutorial indeed.